The world's first "Panorama" or Plan Position Indicator (PPI) display radar was built by Gema in 1940 at Tremmen near Berlin. The 20 m large antenna is located in the top of the concrete tower and it rotates through 360 deg. at 6 rpm. Range is 120 km. 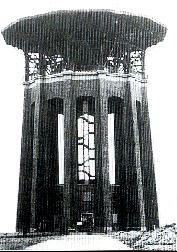 The radar display station is located in the base of the tower and a PPI display, as shown above and below was used. 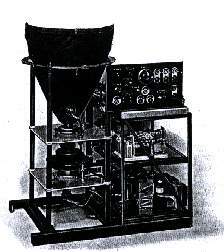 The PPI radar was invented and patented by Hollmann in 1940 and developed by Gema in 1937. See CRT. The figure on the bottom left is the PPI unit from the "Jagdschloss" radar which was based on the radar at Tremmen. Below and on the right is the Tremmen PPI display of a night attack on Berlin in 1944. Over 400 bombers are shown. This unit could not be jammed and it was operational up to the end of the war. 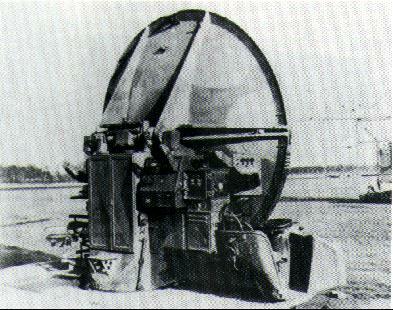 The Wuerzburg-D (FuMG 39 T/D) on the left was one of the most advanced radar units to be used during WWII. It had a range accuracy of 25 m. It was used extensively for gun-laying. Below is a description of how it worked. The Wuerzburg D and Riese used several CRTs. 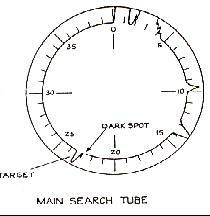 Distance was shown on the main search tube shown above. While elevation and azimuth was shown on two other CRTs. 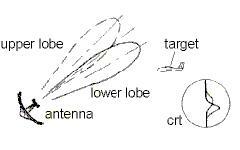 Figures to the left show how elevation was determined by the use of two lobs emitting from the slewing antenna. When the blips on the CRT were of equal size as shown on the bottlm, the antenna pointed at the target. A rotating dipol was used at the center of the antenna so both elevation and azimuth position could be determined with one antenna. 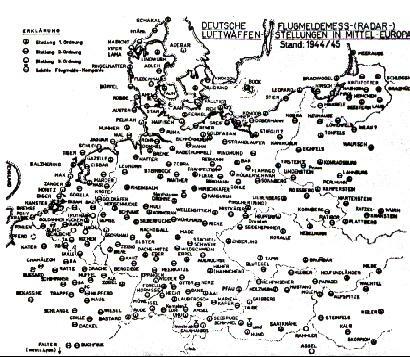 German radar sites in Europe, 1944-1945. 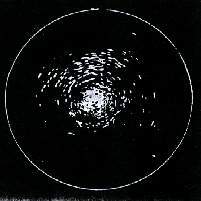 Each site consisted of several radars, typically 2 Freya and 2 Wuerzburg-Riesen. The GEMA factory in Berlin. The picture was taken after the war. Most of the equipment and many of the people were deported to Russia as part of the war bounty. Some of the buildings were destroyed by the Soviets after the war. In 1940, Gema employed over 6,000 people.